Dan Lord & The Big Shots, hailing from South County, RI, are a rocking and swinging band whose musical message is “Let’s Dance!” They keep the joint jumping with a dynamic blend of tunes from the early days of rock and roll and blues, through to today's modern interpretations, including a healthy dose of swing blues, jump blues, and Tex-Mex. Some of the inspirations are from artists like B.B. King, Chuck Berry, Fats Domino, Louis Jordan and Albert Collins -- and even Duke Ellington, to current artists like Duke Robillard, Fabulous Thunderbirds, the Mavericks and Delbert McClinton. They also perform their own original compositions. All designed to keep the feet moving! The band is characterized by the varied experiences of its talented members who have played in many contexts and genres. 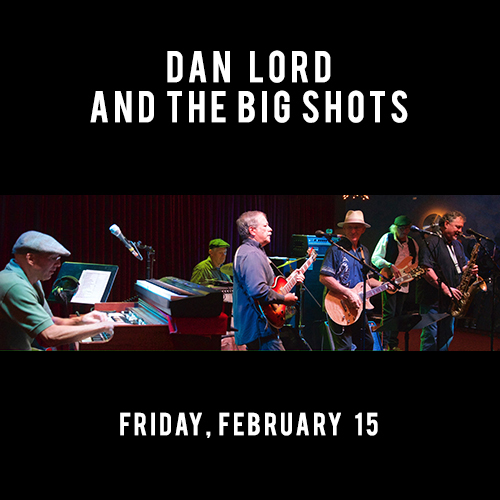 The Big Shots are anchored by the lead vocals and guitar, and songwriting of Dan Lord, who has been playing with ace drummer Mike Bennett for over 20 years. Bassist Bill Gilroy has teamed with Bennett for over 16 years to provide the band with a driving and telepathic rhythm section. Bill’s bass also pumps up the popular local rock/soul/R&B band Toolbox. Lead guitarist and killer soloist Mark Baker, also a member of the Baker Brothers jazz band with a monthly residency at Perks&Corks, has played and taught music professionally for decades, including with the classic jazz and blues of the great Louis Camp Band. Donn Watson brings his piano and majestic B-3 organ sound so vital to many blues to The Big Shots from his former gigs with local favorites New York Minute and Big Cat. Mark C. Hadden accents the music with tenor, alto and soprano saxophones, bringing to it his influences from playing jazz, spiritual music, bluegrass, Grateful Dead, pop, rock and blues. He also currently plays sax for UnderEstimated Prophet, The Dead Blues Society and as a member of the Mark&Mark and Greg&Mark Trios.